See below for Rating Codes and for info about submitting ads for this page. 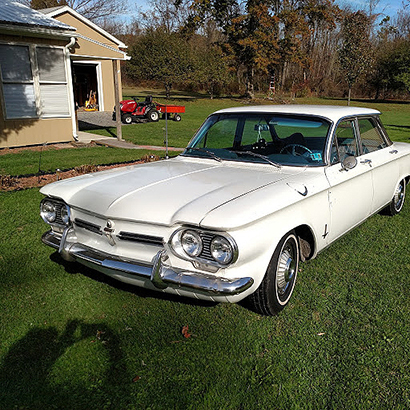 1962 Corvair Monza 900 1962 Monza sedan. No rust, 4 speed, 140,000 miles. Spare motor spare transmission 2 rear windows / 3 boxes of parts. New carpet / upholstery / dash pad / clutch / front end rebuilt / new battery / tuned up / runs great. Needs some paint work. 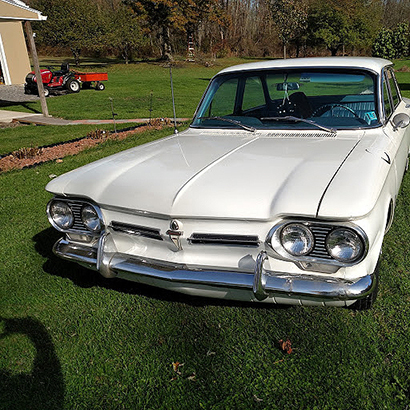 1962 Corvair Monza 1962 Corvair 4 door Monza 900 for sale. Second owner. Powerglide transmission, 84 H.P. engine, 35,033 original miles. Exterior paint and interior original. New muffler and tail pipe. 2 new tires, rest are original. Color Gold. Asking $9,000. Never driven in inclement weather or in winter months. Email inquires to dloucks2@twcny.rr.com. NOTICE: all advertisement is subject to our approval for appropriate content, but not accuracy. No ads will be accepted that list parts for sale or wanted. Clark's Corvair Parts, Inc. will not be held responsible for any costs or damage incurred or loss by seller or buyer due to an ad. Total liability to Clark's Corvair Parts, Inc. for omission or errors in entering the ad will be limited to the cost of the ad. You use the information supplied to us and displayed here at your own risk. COST: $5 for up to 50 words and 1 photo(include Email or phone number) or $10 for up to 70 words and 2 photos. Photos will not be returned.